Our schedules fill up quickly leaving it difficult to find time to exercise. Cubii Jr allows you to workout wherever you want, home or office, on your schedule. Skip the gym and exercise where you are most comfortable. Whether it's at home or at the office, Cubii Jr's compact design allows you to discreetly exercise. Easily slip it under your desk and pedal away. Our compact elliptical gives you time back so you can spend more time doing what you love. Cubii Jr is the only compact elliptical NEAT Certified by the Mayo Clinic for active sitting. In a study conducted by James Levine, MD, a leading obesity expert, when compared to stationary sitting, Cubii Jr. increased participant's energy expenditure by 84.5%. For comparison, a standing desk only increased participant's energy expenditure by 16.7%. The average user burns 150 calories per hour. Track in real time with our built-in display monitor which records time, calories, distance, strides and RPM. Cubii Jr's ergonomic design helps you go beyond the calories to improve your posture and engage your core. When using an elliptical machine, your feet never leave the pedals making this workout easier on your joints, particularly knees, hips and back. Other peddlers on the market tend to mimic the motion of a bike vs Cubii Jr's elliptical motion. The range of motion on a bike is typically a lot higher than an elliptical which puts more pressure on your knees. Because of Cubii Jr's patented ergonomic angles, its smooth and unconscious elliptical motion won't cause your knees to hit the underside of your desk. Unlike other bulky fitness equipment, Cubii Jr is a compact and beautiful product that blends with the interiors of your space. Because of our quality construction, Cubii is a proud winner of the 2016 GOOD Design Award. Each unit is personally inspected and tested to be whisper quiet prior to shipping. We offer lifetime warranty and customer friendly support with 30 day money back guarantee. Low impact on joints with 8 levels of resistance to increase your activity over time. Whisper quiet with a smooth gliding motion. Quick and easy assemble. 4 screws and you are done! 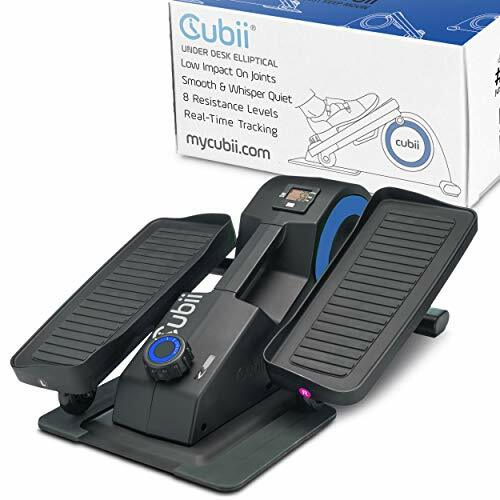 Keep Fit While You Sit, you can multitask with the Cubii to make exercise a breeze. A built- in display monitor tracks real time, calories, RPM, strides and distance. If you have any questions about this product by Cubii, contact us by completing and submitting the form below. If you are looking for a specif part number, please include it with your message.